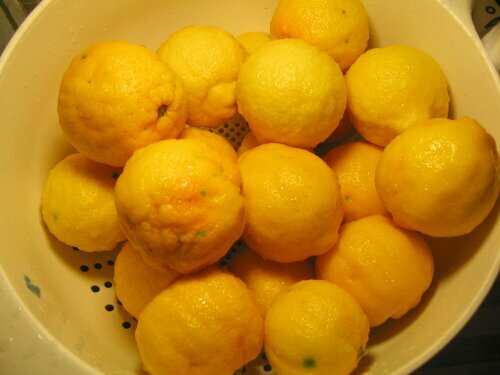 We’ve had a huge number of lemons here at home over the past few months, first from our tree and then from next door. After we’d used ours up I kept staring longingly over the fence at the tree in the neighbor’s yard. When I finally asked if I could pick a few he was glad to have something useful done with them. I’ve got a couple recipes for pickling them, but my favorite is from Manisha at Indian Food Rocks. Check out her recipe. It works like a charm! I see many loaded, unharvested lemon trees in the bay area. Let all their owners donate their fruit to me! I’ll repay in pickles.